The brain is a unique structure within the body that has the ability to change and adapt to various changes within the body. Particularly in regards to those who have lost the ability to see or who have reduced visual abilities. 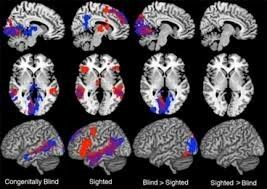 According to scientists from the UCLA Department of Neurology "Blindness causes structural changes in the brain, indicating that the brain may reorganize itself functionally in order to adapt to a loss in sensory input" (University of California, 2009). It was also concluded that there were areas of the brain that were significantly larger than those who do have visual ability. For example, "the frontal lobes, which are involved with, among other things, working memory, were found to be abnormally enlarged, perhaps offering an anatomical foundation for some of blind individuals' enhanced skills" (University of California, 2009). This differs from those with normal vision. Those with normal vision tend to have frontal lobes that are what is referred to as normal in size. Therefore, they do not tend to have one sense that is particularly stronger than another due to their ability to use all senses. The Video below discusses the brain structure and function of an individual with normal visual ability. It is the connection between the brain's neural signals and the retina that information is sent and processed within normal vision. For example, the "ganglion cells in each eye produce action potentials that are conducted along their axons to send visual information to the brain" (Breedlove, 2013). There is a specific condition that occurs when the two eyes are not properly aligned within the first few years of one's life. This condition is known as amblyopia. Due to the eyes being misaligned, the primary visual cortex of the child tends to suppress the information that arrives within the cortex (Breedlove, 2013). Therefore this results in blindness in one eye. This differs from normal development, as within normal vision, they eyes are properly aligned within those first few years and the information successfully arrives within the visual cortex. The visual below discusses the aspect of how brains are built and essentially developed. The following articles provide valuable information regarding brain development and structure of those with normal visual ability and those with lowered visual ability. "What Happens in the Brain When Blind People Learn to See With Sound"
"Blindness causes structural brain changes, implying brain can re-organize itself to adapt"
"The unique construction of the blind brain"
Breedlove, S., & Watson, N. (2013) Biological psychology: An introduction to behavioral, cognitive, and clinical neuroscience (Seventh ed.). Sinauer.